We find, however, both of these claims to be untrue. The sun does not rise from the east for all locations on earth. It is admitted by academia that the sun is often displaced by, as an example from one particular location, several sun diameters from east on this day, with an allegation that it is only from the equator where the sun rises from the east. Further, it is admitted by academia that equal times of day and night do not occur for this day all over the earth. The day of equal day and night is location and time specific. 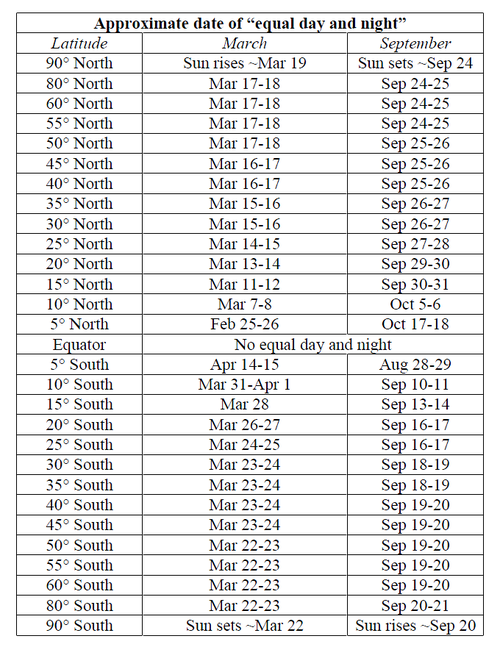 The period of equal day and night does not occur until several days after or before the equinox and, for some locations, the period of equal day and night does not occur for a time period measured in weeks away from the day of the equinox. Finally, the Equinox under Flat Earth Theory is discussed in the section A Flat Earth Equinox. 3.2 Approximate Date of "Equal Day and Night"
"The time or date (twice each year) at which the sun crosses the celestial equator, when day and night are of equal length (about 22 September and 20 March)." Late Middle English: from Old French equinoxe or Latin aequinoctium, from aequi- ‘equal’ + nox, noct- ‘night’. “ Does the equinox sun really rise due east and set due west? The March equinox signals spring in the Northern Hemisphere and autumn in the Southern Hemisphere. On this day, the sun rises due east and sets due west. “ Why is the equinox important for permaculture? “ The original motivation for this paper was the Journal article by Attas & McMurry (1999) entitled “Nailing the Equinox Sunrise.” In the article it is stated that “on the equinox, the Sun should rise due east.” Since the Sun crosses the celestial equator at the equinox, and since the celestial equator crosses the horizon at 90º and 180º azimuth (due east and west), that statement appears on the surface to be correct. Once the effects of astronomical refraction are considered, however, the phenomenon becomes a little more complex. We note that, while the failure of this prediction to meet reality is acknowledged, and remarks to the nature of 'only at the equator' are given, no observations of the sun at the equator are actually referenced. It is claimed that this day is a special day which receives equal day and night. The very name equinox, indeed, means 'equal day and night'. Approximate Date of "Equal Day and Night"
The falsity of the claim is acknowledged by the above. For further research purposes, it is unfortunately not referenced from which longitude or longitudes this information was gathered from. Like with so much else in the model, the refraction argument is used as a sweeping rebuttal to anyone who sees the sun for longer than it should be, shorter than it should be, or as a rebuttal to anyone who sees it rise from a location where it should not rise from. When it comes to specific assertions, the Round Earth model is unable to be justified with a prediction that fits reality. Q. How can the sun rise from even within two degrees of Due East in the Flat Earth model? A. This is a popular topic point, but is based on a common misconception. The top down views of the Flat Earth sun models might imply that the observer can see infinitely across the earth, and see the sun at all times. However, we cannot see infinitely into the distance. The distance to the our horizon is limited to a very finite circle around us. We cannot see that far. The distance to the horizon is limited by the thickness of the atmolayer. The atmolayer is not perfectly transparent. At night when we look out at where the sun would be across the plane of the earth we are looking into hundreds of miles of fog, and thus the sun is dark and unseen. Beneath and around the sun is a circular area of light, which represents day. The sun is projecting its image upon the thickness of the atmolayer around it (see Magnification of the Sun at Sunset). This image of the sun upon the atmolayer has been colloquially termed the apparent sun. Along the edges of the suns circular area of light is sunrise. When the circle of the sun's light intersects with the observer's personal circle, or "dome", of vision, sunrise will occur for that observer. 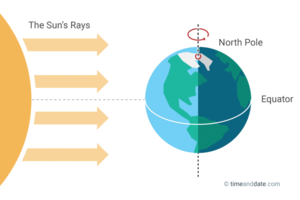 During Equinox the sun is over the equator, with its circular area of light pivoting around the point of the North Pole. The points on the edge of the sun's circular area of light are tracing along the latitude lines, the time of the Equinox being a circle pivoting around itself. Further, the circular latitude of the equator is very large, and if one were to zoom into a segment of that circle, down to human standards of an observer's small circle of vision, down to a town/personal scale, the curve of the equator beneath the observer would straighten out. The latitude line beneath you locally is relatively straight. When the edge of the sun's area of light intersects the observer's circle of vision it will approach from the East, or near the East. The apparent sun at sunrise is on the rim of the sun's area of light and is racing upon the atmolayer along the observer's latitude line to the observer. However straight the observer's latitude line is in his or her local area where the observer can see will be how close to East the sun will appear in its initial bearing. If there was a race car (or jet ski) racing along the surface of the earth to you on your circular latitude line, and you only see it when it is nearby, would you see it from the East or very near the East? If so, then that is the answer. Q. According to FET the sun is perhaps 3000 miles high, and is unlike a race car or a jet ski. How is this answer applicable? A. The sun that we see is a projection on the atmolayer. Its image is close to the earth. We cannot see through all of the atmolayer at once, only out to perhaps 20 - 30 miles at elevations near sea level. When we look at the sun at sunrise, we are seeing its nearby projection which intersects and appears on our dome of vision that represents our limits of sight. A cloud traveling around your latitude line towards you would also appear from the east when it appears, just like a jet ski or a race car would. Hence, the analogy is directly applicable. If clouds, jet skis, and race cars would appear from the east to our limited range of vision, as could the sun's projection. Q. Is there any evidence that light can project onto the atmolayer? “ Until recently, ground-based astronomers had to simply accept the distortions of seeing, but now they can partially compensate for such seeing in several ways. One technique involves observing a known “reference” star simultaneously with the object of interest. By measuring carefully how the atmosphere distorts the known star's image, corrections can be made in the pictures of other objects. Unfortunately, it is rare that there is a bright enough star close enough to an object of interest for this technique to work. Astronomers have therefore developed a technique using a powerful laser beam to create an artificial star where they need it. While the sun is not a laser, and the direction would be reversed, with presumably different physics from going from space into the atmoplanar medium, the example provides evidence suggesting that projection of light upon the atmolayer is possible. This page was last modified on 19 April 2019, at 02:24.